Well this is interesting, if not a bit odd....but without doubt a premonition or at least a foreshadow of what was to come. But I'm getting ahead of myself as I often do...my mind usually thinks faster than my fingers can peck the words out. I'll start over. Last week I was cleaning out a room in my house; a small room which I fondly refer to as the "junk room" because it's more of a storage space than anything. I was cleaning it out because I'm planning on rehabbing it into a new bedroom for my son. Anyhow, cleaning it also meant giving away and/or discarding some old stuff; thus I was going through some old boxes. In one of the boxes was an old Boy Scout's uniform...yes, believe-it-or-not, for a very short period as a lad I was a scout; only made it to Tenderfoot. This would have been in 1971 or 72. The reason I remember is that I lied about my age to get in (yes a bit contradictory to the ethics they are trying to implant in the young kids); I was 10 years old and the age requirement was, as it still is, 11 years of age; this was 40 years ago. It's interesting that I remember this because I don't remember much else about my short tenure as a scout. 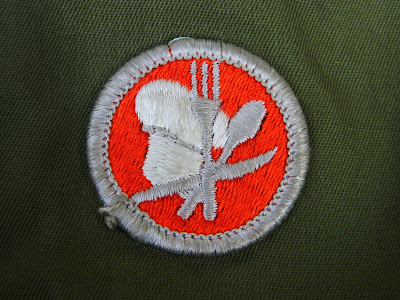 But I do remember practicing for my one and only merit badge, the one pictured above....a cooking merit badge. My mom helped me make scrambled eggs. It's interesting, though, that I don't recall any early inclination that I wanted to cook, but that was the one and only merit badge I strove for. I hadn't even remembered it until this past week. I would have never imagined what was to follow. Five or six years later I would get my first job, peeling potatoes and chopping onions in this Greek diner. A few years later I'd work for a European chef that would influence me to take cooking not just a source of income but as a career choice. Culinary school and a series of chef jobs followed....needless to say I've been facing a stove for the past 34 or 35 years. And this is what I thought about as I stared at the merit badge when I found it in a box. Coincidence? Maybe. Premonition or foreshadow? Possibly, but who knows? But you ave to admit it is pretty interesting. One thing is for sure, and whether I like it or not, ich bin ein koch. And now, as I just breached the 50 year mark, I am trying to figure out what to do with the remainder of my years on this spiraling orb we call Earth. If you'd like to read more about my views on cooking for a living (and why I used a German phrase in the previous paragraph), which was recently in Buffalo Spree Magazine, click here.